25 Perfect Days is a collection of twenty-five short stories all linked together in some way, each written from a different character’s point of view. The book spans decades and generations, showing the decline of society into a totalitarian state where the government and a radical religion are one and the same, and overpopulation is leading to massive food shortages, congested cities and pollution. It’s a scary look at how extreme measures to counter these problems can cost the people their personal freedoms. And as a special treat, since blog contributors Mogsy and Wendy both recently read this, we thought we’d try something different and do a co-review! Thanks to the publisher and NetGalley for providing review copies. 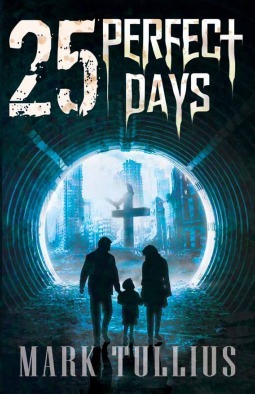 What did you think of 25 Perfect Days’ concept of a dystopian world compared to other books with similar themes? reasonably unique twists on many things we’ve seen so far, such as the all powerful church combining with state to create this oppression. Some elements, like the weight requirements, were new to me. That chapter was particularly shocking and it was frightening to see the lengths people were going to to remain under the ever decreasing weight cut off. Mogsy: Yeah, I agree that as dystopian novels go, I thought Mark Tullius did a great job creating his disturbing vision of what could happen if a government is given too much power over its people. And I feel the same way as you regarding the gradual move into the dystopian future. Usually when I read these kinds of books, the dystopia is already in place, as in whatever took place to bring the society to this state has already happened and is in the past. author’s way of presenting the novel was a brilliant idea and also quite realistic. What did you like about the book? What did you think the author did well? Wendy: I liked the entire concept of moving through these twenty-five days, spelling out this horrible world and the people within it. I liked the way the chapters made you have to think and infer what the different situations meant in order to paint the overall picture of this society. I liked the way the chapters intertwined with the ramifications of actions in the previous chapters weaving through the story, along with the various players. the stories became an enjoyable part of the reading experience itself. Of all the characters in 25 Perfect Days’, whose story did you like the most and why? family the best. She was one of the more memorable characters, and since one of the major themes in this book is about the love and sacrifice needed to survive and overcome the tyranny, I thought the Salazars’ stories were all perfect examples. One of the earlier chapters about Maria’s fight to come up with the money to keep her newborn daughter was heartbreaking to read, especially for a mother. And then of course there was the story about Enrique and how he risked everything in order to procure food for his family, not to mention Vanessa Salazar, just an infant at the beginning of this book, who grows up to be a major part of the resistance along with her own child. Their family just seems to be quite central to the book. because they weren’t around long enough. There were characters that I wanted to like and know more about, like the Salazars, but because of the format of the book, we never get enough time with any given character and when we see them next, years have passed. What didn’t you like about the book? What aspect of the book needs improvement? Wendy: Unfortunately, what I liked about the book is also, I think, its major flaw. The brief chapters developed the world, but it didn’t strongly develop the story, and worse, it didn’t give me enough time with the characters. Many of them had some really great moments, particularly the ones that sacrificed themselves to help others escape, but other than the obvious nature of their motivations, there just wasn’t enough depth to any of them. And since many would show up in the future chapters, it was a bit frustrating when other characters that I thought were important, based on the amount of time spent with them in their chapters, didn’t show up at all. By the end of the book, I was just confused with the names, feeling like I needed a spreadsheet on the wall to keep track of everyone. There is a character glossary in the back, but even that proved too confusing. Mogsy: I had a similar problem. While I liked the format with all the linked stories and the twenty-five perspectives, this also made it very hard to connect to any one character. Personally, that’s very important to me as reader. It’s why I usually hesitate to pick up anthologies or collections of short stories. Like I said, there were some central characters or families that play a larger role or are more central to the overall story, but that left the more minor characters in the background. It was hard to keep track of the relationships, especially when it was a struggle to remember certain people. If it weren’t for the list of characters and their connections at the end of the book, I wouldn’t have been able to remember most of them on my own. I just think that in a book like this, where almost everyone and their stories are linked in some way or another, not being able to recall the details for some of them or why they’re important diminishes the full effect somewhat. Interesting how our opinions have such similarities. Any final comments about the book? Mogsy: Overall, 25 Perfect Days was a good read that kept me turning the pages and wondering how much worse this dystopian society could get. Though, now that Wendy’s mentioned it in her answer to the last question, I do think the writing could have used a bit more tightening up, especially when it comes to the action scenes. Some of them were quite difficult to follow, especially when it comes to who does what and who speaks certain dialogue. Just some more description and detail into the setting and action would help me play the scenes out in my head and see them a lot clearer. Other than that, I enjoyed this and didn’t mind the darker ending too much. It’s also nice to read a dystopian novel with elements in it that are more reminiscent of the classics. Wendy: I’d give this book a B for the effort, but the execution could us some more work to make it cleaner. The chapters could have used more fleshing out to, in turn, allow the characters to be more fleshed out. But I do love the concept and loved that I was completely thrown off of my expectations with the very first chapter. I suppose I was expecting something a lot more pleasant, at least to start, from a book with the word “perfect” in the title!